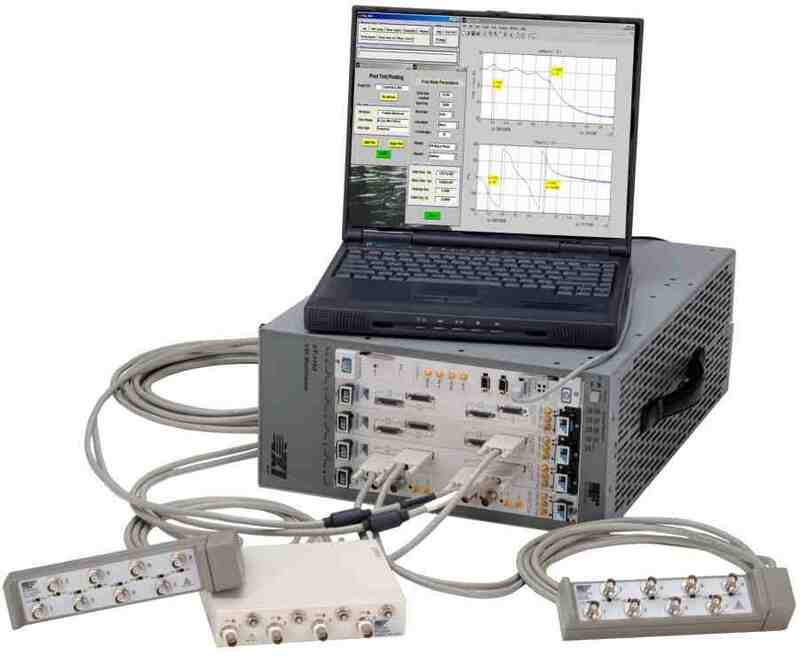 Dynamic Measurements offers two user friendly, general purpose turnkey Data Acquisition & Analysis software products, Acq_Mat1432 and Acq_Mat1564 for controlling VTI Instruments, Hewlett-Packard or Agilent VXI modules. Now, Very Low Cost, complete systems built with used VXI Modules. Perform either MIMO (Multiple Input Multiple Output) or SIMO Frequency Response Measurements (FRF's). Import Excel files with channel parameters like EU, EU Sensitivity, ID, etc. Capture simultaneous sampled, continuous Time Data from N channels. Choose 2, 4, 8 or 16 Trace Data Formats with Dual Cursors on each Trace (except 16 trace case). After the measurement is completed, choose a different number of traces and starting channel and re-plot the data. Take advantage of the Mathwork's MATLAB® graphics to simply bring up the graphics attributes and change the default plot parameters. Selectable simultaneous sampling periods from 0.838 seconds to 0.00000125 Seconds (sample rates from 1.19 Hz to 800,000 Hz). Automatic module find with printout of VXI address and installed memory. Trigger support for Immediate, Channel 1 Arbitrary Level +/- (rising or falling) and Ext (rising or falling). Select the number of Pre-Trigger samples. Set the on-board filters independently for each channel, or globally set all channels to a single filter setting. Set the Range for each channel independently or globally set all channels to the same value. Set the acquired array (block) size to any integer value consistent with the amount of RAM in the module. The data will be stored in a three dimensional MATLAB® matrix (samples at blocksize, Channels, Scans). Built on top of Mathwork's MATLAB® so further data processing and custom graphics can be readily accomplished.